My first few encounters with Akshaya were mostly about numbers and data, and research studies for the brands that we jointly worked on. It wasn’t till much later in our working relationship did we connect a bit more at a personal level, and over our love for Matter pants. At work, she has an unfaltering calm and zen presence. Beneath her researcher hat, I learnt that there’s an aspiring writer, an avid hiker, and a very free spirited soul. Once told by an acquaintance that the advertising industry might not be so suitable for her because "people there drink a lot", it might be hard to believe that these days, it won't come as a surprise if the last (wo)man standing at a party is her. Over coffee one weekend, at Plain Vanilla bakery in Tiong Bahru, we sat down for a chat about career, aspirations and life. Nicole: You currently work as a Content & Insights lead at a media agency. How did you end up in this field? Akshaya: I studied math, and I also did my MBA. I knew I wanted to get into advertising. Somehow, anything to do with advertising just appealed a bit more to me. My first job was with TNS in Madras (Chennai). Because of my math background, I’d normally just go into quantitative research but because my boss back then believed that we should have exposure to both qualitative and quantitative research, I ended up doing both. N: It’s been 10 years or so? A: 12 years to be exact. And about 7 years ago, I moved to Singapore. N: Can you share a bit more about your research work and what you enjoy about it? A: I've worked on everything from jewellery to spice powder, and generally enjoy the whole concept of qualitative research and speaking with people. If we were working on a product like a toilet cleaner, we would have to go and see how people clean their toilets. It requires a lot of intimate understanding. I'm from the South (of India), but I also knew Hindi, which meant that I could be part of qualitative studies that required me to know multiple languages. This was really interesting to me because I like understanding different cultures and ways of life. It was amazing for me to go into parts of rural India and get that perspective, especially in a country as diverse as mine - and gain insights into why do people behave the way they do, and what they react to. In my current role, I like the whole process of putting out points of view or developing something new. N: Outside of work, what are you passionate about? A: Writing. And stuff I can do with my hand, such as block printing. I like natural fabrics and patterns, and learning about different textile techniques. But normally it’s writing. Yoga for sure. Food - both cooking and eating. When I started living on my own, my ambition was that if I want to eat something, I should be able to cook it. I find that quite therapeutic. N: Do you remember the last time you lost track of time? A: It’s normally if I’m writing something or reading a crime novel. The last time I was writing, it was poetry which I’d never done before, as part of a workshop, and the final feedback I got was that I sounded very angry. The instructor said that I have a lot of anger in me, which I thought was interesting because I had always assumed it was something slightly less aggressive, like passion. It was a workshop over a couple of weekends, they give you cues and you can write whatever you were feeling strongly about. "Writing poetry is a good way to channel anger (or frustration) constructively." N: Perhaps you were stressed at work that week? A: (Laughs) Ya, of which went into the writing. But I realised there were unresolved issues (not work haha) and writing poetry is a good way to channel anger (or frustration) constructively. I did feel lighter after it. N: When did you start learning poetry writing? A: I didn’t learn, I think I just have it in me (laughs). I can’t rhyme or anything, but I think the idea of having to be more disciplined than prose makes you really boil down what you are feeling to the essence of it. Every first Monday, at BluJazz, they have like a speakeasy where everyone does spoken word. I went for those and I was amazed by it, and realised there’s a lot of support for it. It was very inspiring how brave some people are. Honestly I’ve only started writing this about 2 years ago and not very frequently. But I do enjoy it - the disciplined thinking especially. A: Yes. When you have to think about the root cause of why you are writing something that you feel so strongly about, you sometimes realise that you may be annoyed with something (or someone...) completely different from what you assumed when you started. N: So have you published any of your works online? A: I’ve been too scared to publish my work, and to put it out, and know what people will think. But I have recently set up a website. Not publishing the poetry bits (yet). I think it can get very specific and personal sometimes, because it’s something you’re trying to get off your chest. My website will mostly be about food and mountains. Not of food and restaurant reviews (I don’t really understand the end point to that), but of food and how it impacts a culture (hopefully). The website is live, but it isn’t ready for public launch. "I don’t know if its a geek fest for me or whether it’s something people are interested in. That’s interesting to me. Not sure who would pay me for it though." N: So let’s say you could choose do one thing all day long, and get paid for it. What would that be? A: Difficult to choose one. Like you know, I’d like to write, and get paid for it. I like the whole concept of the history of food, where it came from, and understanding traditional dishes that's makes up part of a culture. Like Singapore, there are so many foreign influences that came from it being part of the various trade routes. Similar to the part of India that I came from. I don’t know if its a geek fest for me or whether it’s something people are interested in. That’s interesting to me. Not sure who would pay me for it though. N: You’re also an avid hiker. Tell us more about it. I have good memories of our conversations on hiking. A: It surprises a lot of people. I don’t look like an athlete. I like how mountains make me feel so tiny. It started when I was working at Madras (Chennai). One of my colleagues who used to run ultra marathons asked me to go with her on a trek. My first trek was in the Ghats of Western India. We did the route that was along an abandoned railway track. We thought it was abandoned but they had actually started test runs. When we were crossing the bridges over the gorges, there was a possibility of a train coming behind us. We had to run across these and I am terrified of heights. I think that adrenaline rush is something that’s never left me. 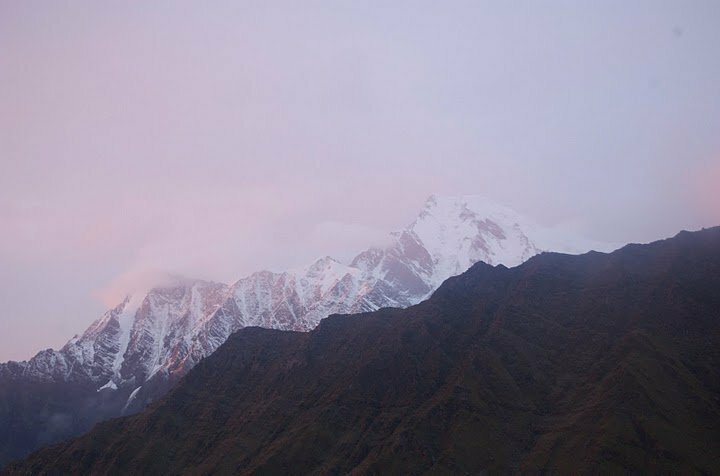 Years later, she suggested we go to the Himalayas, and we went to Roopkund. It was good fun and maybe the most difficult thing i have done physically. To date, we still try to incorporate trekking into our trips. We realised we couldn’t go to the Himalayas every year like we wanted to if we were to see other parts of the world so now we try and do a trek, even a short one, wherever we go. Nicole: What are your fears in life, if any? A: That I am not doing enough to leave a mark or make a difference. "My dad’s advice on following a creative career was that you have to be superlatively brilliant to earn a living from it. If you are a mediocre artist, you will definitely not put food on the table but if you are a mediocre engineer (for example), you will put some food on the table." Nicole: Finally, do you believe in merging passion with your career? A: I would like to but I’m not sure if it’s sustainable, and I haven’t tried it yet. It’s only now that I have made a focused effort on putting my passion of writing out there because if I don’t put it out, then I won’t get any kind of feedback and I won’t know how good I am, or not. My dad’s advice on following a creative career was that you have to be superlatively brilliant to earn a living from it. If you are a mediocre artist, you will definitely not put food on the table but if you are a mediocre engineer (for example), you will put some food on the table. So the website will be a test of that. Besides I also like work quite a lot - not sure if I actually do want to give it up completely. Thanks for your time Akshaya, it was great to co-create something with you again.